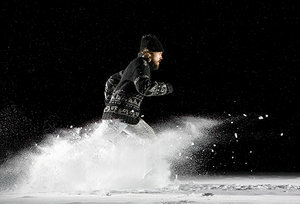 When winter hits, does your workout take a hit? All the typical excuses seem to converge all at once: "It's too cold!" "It's raining!" "The kids are back in school and I don't have time!" Are these the conversations floating around in your head these days? Then it's time for a self-intervention. Early to Rise: Commit to a morning workout and enjoy the rest of your day, secure in the knowledge you've crossed it off your "To Do List." Wait until evening and multiple variables could intervene, upping the odds that you'll say, "I can't" instead of "I already did." Good Investment: Making sure you've got the proper exercise apparel is essential if you're working out in inclement weather, particularly if you're braving the outdoor elements. It goes beyond protecting yourself from the potential cold and moisture; it's also about making the experience something you look forward to. Buddy System: Schedule your workouts with a partner to keep each other from "bailing out" on a bad day. Communicate the night before each workout to verify participation and stay motivated. It's a lot harder to stay in bed when you're workout partner's pounding on your front door, raring to go. Talk to your doctor for more strategies to make 2015 your best year ever. Remember, no one said getting – much less staying – shape was easy, but one thing's for sure: You can do it.